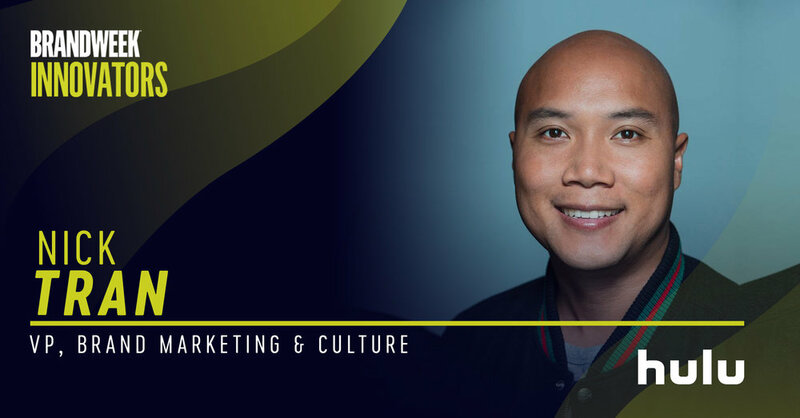 As the VP of Brand Marketing and Culture at Hulu, Nick Tran leads a team in charge of defining and shaping the overall customer experience and relationship with the brand. From previous stints with Taco Bell, Samsung, and apparel start-up Stance Socks, Nick carries a diverse background with the common thread of keeping brands at the forefront of cultural happenings. And with Hulu’s steady growth – subscribers increased by 48 percent to more than 25 million last year – and cable viewership on the decline, it’s more imperative than ever for streaming companies to appeal to free agent consumers. Read on to learn how Nick’s leadership style enables him to serve as team captain while letting others lead and how they’re tapping into trends to get more people talking about (and subscribing to) Hulu. Why did you choose to join Hulu? My career path in marketing is interesting because I’ve never worked in the same industry twice – fast food, apparel and technology – which is why my move to Hulu, the perfect intersection of entertainment and technology, was so exciting. Making the decision to come to Hulu was an easy one led by my desire to dive into a new challenge. Beyond that, I was really excited about the momentum and growth of the company, the opportunity to work with my current CMO [Kelly Campbell] and ability to help build the Hulu brand beyond its first ten years. What current developments in marketing are most inspiring to you? I love the fact that marketing is constantly evolving and right now I think technology, like 5G and voice, will predict how consumers build relationships with brands. We’ve seen some promising trends with Hulu viewers who use voice. For example, we know that Alexa users watch more hours of TV than non-Alexa users on Fire TV. With 5G, internet speeds and access improves… It’s a game changer for the industry and critical for live sports streaming because it will allow us to deliver high-quality streams, via our Live TV service, so fans can stream games with higher picture quality and lower latency. What are you working on now that you think is innovative? Hulu partnered with YouTube Influencers to refresh their holiday scenics collections, tapping into the popular ASMR trend. I’m really excited about the ideas coming out of our new culture and innovation lab. The team is especially important because, as a brand, we need to be mindful of how and where we tap into relevant moments in culture. While brand marketing is responsible for what we say to consumers (inside-out) and our culture team is focused on what we do in the world (outside-in). As an example, last month we added two new holiday scenics to our popular seasonal collection that feature a sensory-driven ASMR (autonomous sensory meridian response) approach, all for a good cause. … We were inspired by the popular ASMR trend so tapped into well-known influencers in the space to help us create “Library Cheer” and “The Gathering” and then layered on a Stream for a Cause component. … That effort led to a 50% increase in views of our scenics compared to last year. We also recently reintroduced ourselves to audiences with our “Better Ruins Everything” ad campaign that debuted during the 2018 Emmy Awards. The campaign, which is still running today, includes 15, 30 and 60-second spots featuring a celebrity cast that represents Hulu’s diverse offering of hit TV series and films, Hulu Originals and live sports. We also featured several Easter Eggs throughout the 60-second national launch spot including a cameo with rapper Trippie Redd, a red robe made popular in The Handmaid’s Tale and a cameo and clip of music from Dillon Francis. Within the first 24 hours, we surpassed more than 20 million views of the launch spot and helped to increase social mentions of Hulu by 51% compared to the prior day. Tell us about the big learning moments you’ve had along your career path. I began my career in IT consulting and I can tell you now that marketing is a much more interesting place to play for me. After a few years in IT, I knew I wanted to make a move into the marketing world so I went back to school to get my MBA to ensure a successful transition into a new field. I know this second chapter of my career is what I was meant to do. I live and breathe all things marketing and truly believe I’m exactly where I’m supposed to be in my career. How do you pick and develop the talent on your team? How do you ensure there is collaboration? I’ve had the pleasure of working with some amazing and talented people throughout my career that have helped shape the way I lead my teams. As I look to build a diverse team, I’m always personally involved in selecting the talent. I look for passionate people with a learning mindset that are experts in their respective area, especially if it’s an area where I’m not as strong. I like to use cycling as a metaphor for how I lead my team. Ultimately, I see myself as the team captain in the back drafting different team members at different times. Depending upon the project, a different team member is in the front leading, and I’m in the back of the pack making sure they don’t go off course. Collaboration allows our team to unify under one north star. We can’t grow and push boundaries as a team if we’re not working in a collaborative environment. Some of this happens naturally, but I also like to put a system in place to ensure certain levels of collaboration exist not only on my team but cross-functionally as well. What one thing do you need from your CMO to help you be successful? Trust. Working for a leader who trusts and supports your vision is vital to personal and company success. My day-to-day role is more creatively-led so my CMO uses her strong ability to take data and analytics and craft that into a strategic direction for my team to use creatively, and then trusts we’ll provide the best work possible. What advice would you give to marketers who are just starting their careers? I don’t think you can ever go wrong if you let your passion be your guide. I know it sounds cliché but honestly, if you find something that you love to do, you can spend a lot of time dedicated to it and it doesn’t feel like work. Always be aware of the white spaces, whether within your industry or within your company or team. If you’re able to identify missing links, those can eventually lead to opportunities that allow you to chart your own career path and ultimately become a leader in that space. Choose to do things that people don’t expect you to do. Volunteer to take on a project people don’t want to do, get out of your bubble and challenge yourself to learn something new and most importantly, just start – even if you fail at first. Favorite place to vacation? That’s easy – Italy. I especially love Positano for the breathtaking views, incredible restaurants and idyllic atmosphere. If you were a superhero, what would your special skill be? A mind reader. As a marketer, how amazing would it be to know what people are thinking!? Name something that most people don't know about you. I know Pi to the 40th decimal place. If you weren’t a marketer, what would you be? A college professor teaching marketing or history. I love guest lecturing and get inspired by being around students who are eager to learn. What's the best thing you've read/listened to/watched recently? I’m a big fan of Stephen King and J.J. Abrams and laugh during every episode of The Good Place.